Maya's Happy Place: Allergy-Friendly Gluten-free Amanda's Own Chocolate REVIEW and Holiday GIVEAWAY! 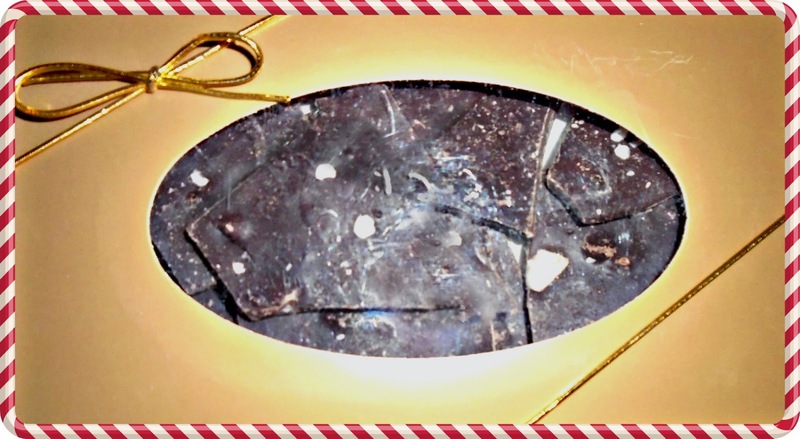 Allergy-Friendly Gluten-free Amanda's Own Chocolate REVIEW and Holiday GIVEAWAY! Ahh, the after-effects of Thanksgiving are now upon us and now we can domino into other holiday celebrations without the guilt. Kind of like ordering a Super-Size with that diet soda back when you used to be able to eat fast food and junk. Sure, those recipes on Pinterest made you saute, bake, fry, marinate and broil your way into a full season of PMS cravings where all you can think about is food. Even after you just ate, you're thinking about what to make later that day to excite your taste buds. Then you think about going to the gym and coming out dripping with sweat. You even changed into your gym clothes while thinking about it. So much so, that you actually felt your heart rate go up and broke a sweat at that very thought. No kidding (insert sarcasm here). Seriously, though, I don't blame you. So you plop right back down and turn on Netflix because God knows you deserve it. And its cold out. Plus they just released another season of American Horror Story/Orange Is The New Black/Big Bang Theory/___________. 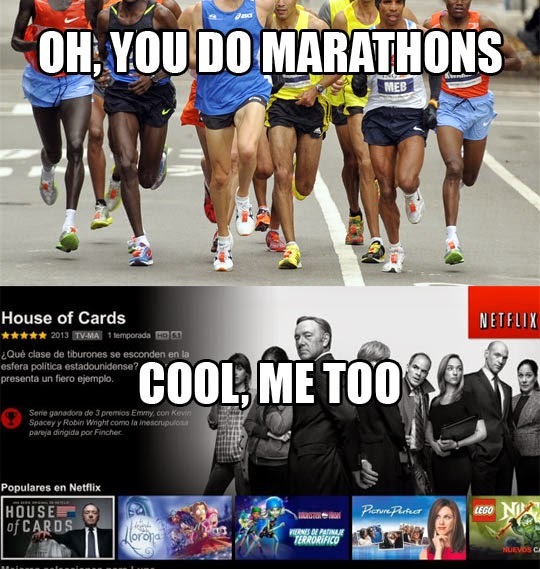 Of course, for me, Netflix is all I watch. I never watched cable TV with my family and I don't watch it now that I'm living on my own. I tend to have what my significant others' deemed as television ADD. It takes a lot for a show or movie to pique my interest and keep my attention. Wait, what?!! Yes! I've moved out and my next post will describe techniques for preparing to move out and stay safe as an adult with anaphylactic food allergies and severe gluten sensitivity while living with roommates! I'm also hosting a holiday giveaway in which I will pick the winner (at random) using a fair online drawing process which will include some chocolate from Amanda's Own Confections and several other of my favorite soy-free and nut-free products! I will take a picture of this grand prize and tempt all of you in the next post! Who wouldn't want to find chocolate tucked in a stocking or within one of these boxes? Simply sign-up for my mailing list by clicking here! I never share your personal info with anyone else and you will only receive a maximum of two to five emails per month. If you're already signed up, you will be automatically entered into the giveaway, unless you are a member of my immediate family. I will pick winners by December 22nd and will contact you through the email address you provided during sign-up, so keep a lookout and check your spam folders! Valid for US Residents ONLY. Void where prohibited. Amanda's Own was nice enough to send me some chocolate to review and the results were nothing short of decadent indulgence. I was not compensated in any form for this review and only received the chocolates I reviewed for compensation, along with a couple of products for the giveaway! Completely nut-free, soy-free, dairy-free, gluten-free and egg-free! Note to self and other bloggers in the blogosphere: Don't share giveaways as soon as you get them. Anything this good will disappear and you will not be able to take pictures in time. Especially when its 1AM and nobody wants their picture taken. Because that seemed to be the usual time I or my roommate would reach for one of these gleaming 'Golden Ticket' boxes from across the room. Thank you, Amanda's Own. Willy Wonka would be proud. Please note: Sunflower Cups may be cross-contaminated with soy since they are made on shared equipment, which although thoroughly cleaned, cannot be gauranteed safe. Stick with the Chocolate Barks or Chocolate Bars instead! According to their site, Amanda's Own Confections was created for a girl named Amanda with several severe allergies. Thank you Amanda for inspiring your parents with a line we could be thankful for. When I told people close to me I was getting some chocolate to review, every single one of them wanted to help me with this project. Eeeny meeny miny MO! 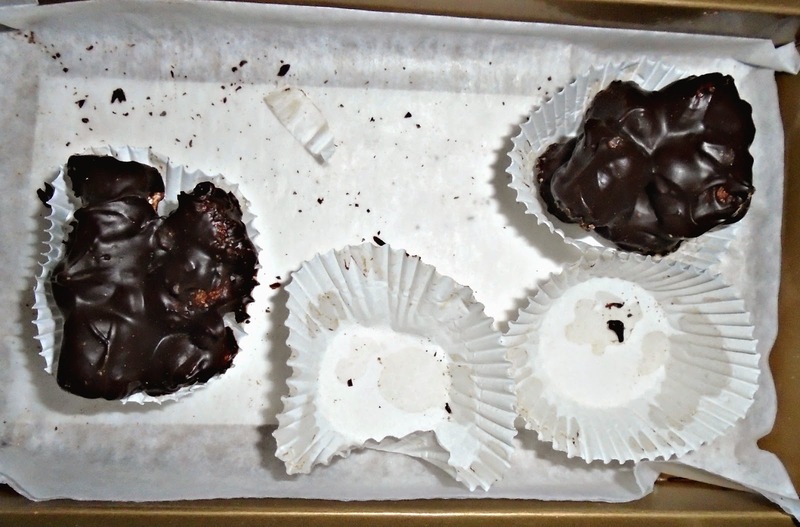 As you can see, these were devoured. Mostly by me. Honestly, I couldn't decide whether I loved these or the Peppermint Bark more. The Marshmallow Clusters were perfect little eat-before-it-melts all over your fingers pieces of marshmallow bursts of sugary clouds of happiness wrapped in bittersweet chocolate. Although they are gluten-free and safe for most, some people with Celiac Disease or severe gluten sensitivity should know that these contain gelatin. I learned the hard way I'm one of those 'sensitive to gelatin' people and will have to add it to my list of things to avoid. ...and then the Crispy Bark. Which I was really looking forward to, since I loved Nestle Crunch as a kid but couldn't have it years later. The sudden labeling for manufacturing in same facility as peanut products threw my risky teenage judgement into a tailspin. Several scares gave me a milder hive reaction, probably due to soy lecithin and then more major itchy throat and hive reactions which needed double doses of hydroxyzine or Benadryl (although now that I know more about protocol, one or two of those definitely merited an Epi). Now we don't have to worry about that, because companies like Amanda's Own Confections provide us with what we want and need. 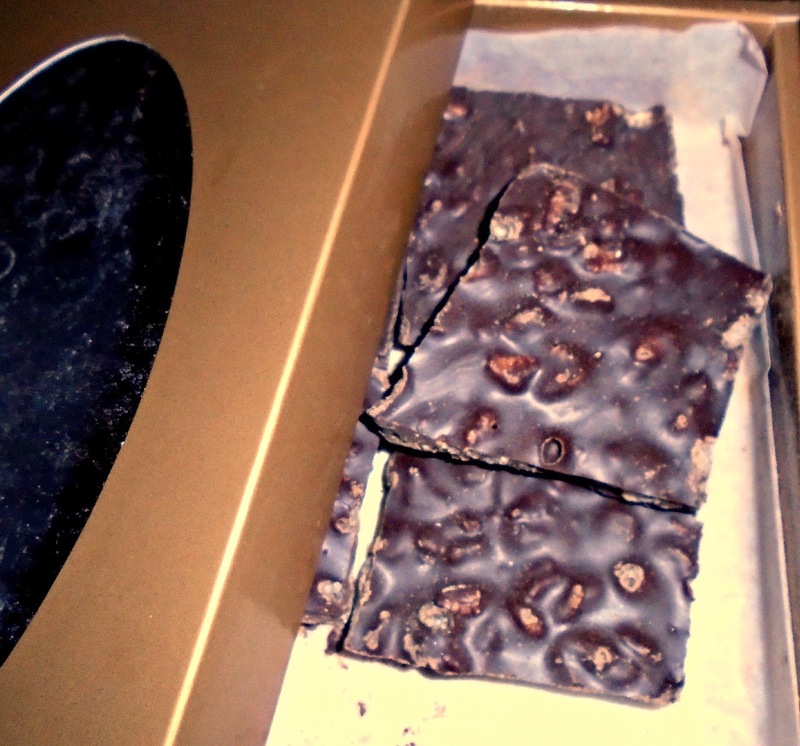 The bittersweet chocolate taste in the Crispy Bark is very similar to Enjoy Life's Rice Milk Crunch Bars. The distinguishing difference within this piece Crispy Bark chocolate is the satisfying thickness and density of the pieces, which makes it a heartier bite than most allergy-friendly chocolates on the market. Even the rice is bigger and crunchier, so if you really enjoy that snap you get with refrigerated chocolate, here it is! No refrigeration required! ...and my favorite of the three, the Peppermint Bark! These pieces of bark, although a bit thinner than it's big brother Crispy Bark, contained actual pieces of peppermint candy! Never before have my taste buds craved peppermint candy more than after biting into one of these. Its like your entire mouth goes on a great expedition looking everywhere and traveling far and wide for the one thing he already has...within himself! These candy pieces are like little shards of peppermint glass and you will literally play Where's Waldo with your senses looking for another piece of peppermint candy to bite into. Isn't it funny how the harder something is to find or eat within something, the more we need? Like lobster. Or sunflower seeds. Or this addictive soy-free, nut-free and gluten-free Peppermint Bark by Amanda's Own! Optimal time to indulge in Amanda's Own Chocolates: During a Netflix binge in between bites of popcorn or after a really savory, salty dinner as a dessert. Or stuck into a gluten-free cupcake. Or in between two graham crackers and marshmallows. How about melting into still-warm just recently cooked gluten-free pudding? Hmm, or stuck into that fudge brownie ice cream sundae? Oh and don't forget chocolate is an aphrodisiac, so it goes well with gluten-free red wine, too...then again, what doesn't? Make sure to share this post with anyone you know who might find it useful or simply to let someone else know about my holiday giveaway! See you all soon!